I was very fortunate to have been invited to a dinner tonight featuring the wines of Château Margaux. Sotheby's is holding an auction in New York this week entitled "A Celebration of the Mentzelopoulos Era" featuring vintages from 1900 to 2010 - where all the wines come directly from the château - and the auction house decided to host a dinner here in Hong Kong featuring a few of the wines. I had the privilege of visiting the château a few years ago and was warmly received by winemaker Paul Pontallier and his lovely wife Béatrice. It helps that Thibault Pontallier, Paul's son, has been stationed in Hong Kong for the last few years to represent the château. He arranged for a shipment of wines direct from the château, so that the wines we tasted tonight would have the same provenance as the ones in the auction. We are, of course, very grateful for this kind arrangement. The food tonight was catered by the Hong Kong Jockey Club, which usually does a pretty good job. Tonight the food was the best I've ever had at one of Sotheby's catered events, as just about every single dish was well-executed. We started with some bubbly before dinner. 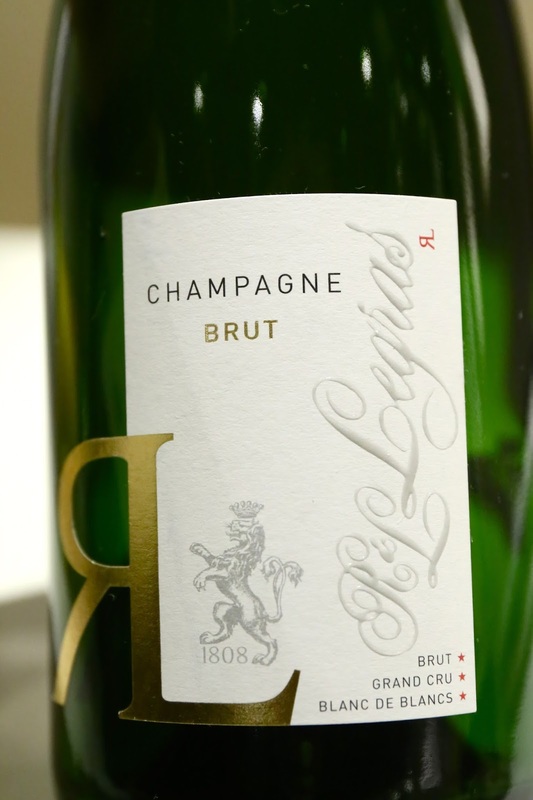 R and L Legras Brut Blanc de Blancs Grand Cru has been the Sotheby's house Champagne for a while, and it's always a nice drink, with good acidity balance. Blue lobster, lemon curd, romaine foam, Parmesan - beautifully poached and flawless execution. The flavors of the lobster were so pure, and the flavors so sweet. The romaine foam was pretty tasty, and the use of lemon curd was pretty interesting. Those bits of Parmesan crackers sure were tasty! 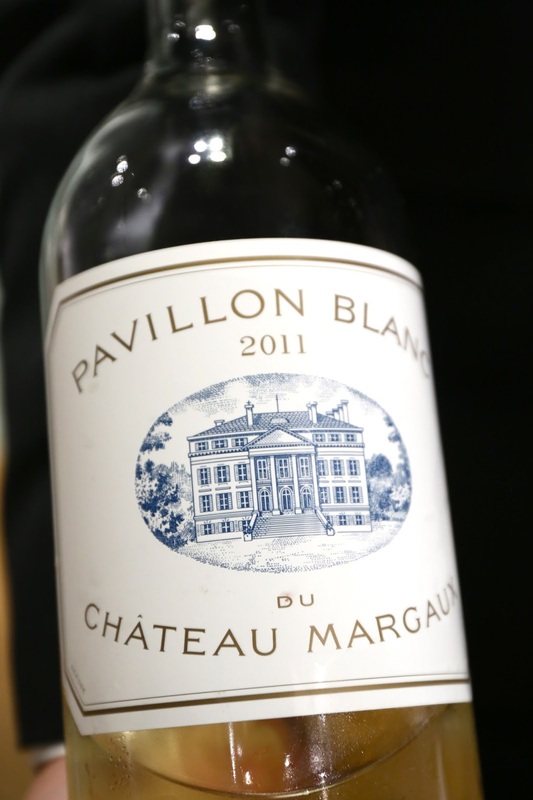 2011 Pavillon Blanc de Château Margaux en magnum - pure sauvignon blanc. Very big nose, with pipi de chat, green apple, muscat grapes, and lemon citrus notes. Lovely fragrance. Very round and smooth on the palate, especially after some food in the mouth. Nice acidity here. So fresh and vibrant! 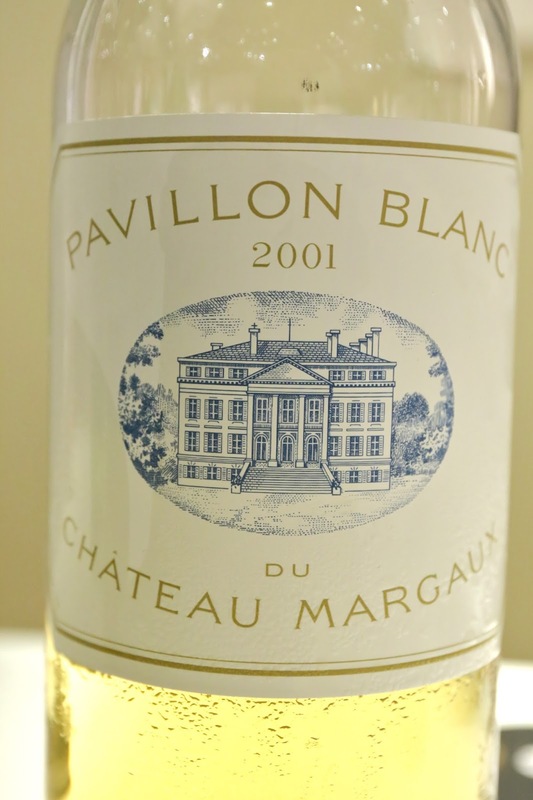 2001 Pavillon Blanc de Château Margaux en magnum - more mature, ripe and full-bodied. Richer on the palate with a longer finish, featuring more sweetness upfront and a dry finish. A little straw in the nose. An hour later the nose was sweet and caramelized. Iberico collar, peas, carrot, Madeira - I was totally not expecting a chunk of iberico pork collar to taste like this, but the Madeira sauce made the flavors heavier than I had expected. The texture was very, very tender... thanks to all the marbling in the meat. Both the peas and the carrot mash were sweet and provided a nice counterbalance to the slightly heavy flavors of the pork. 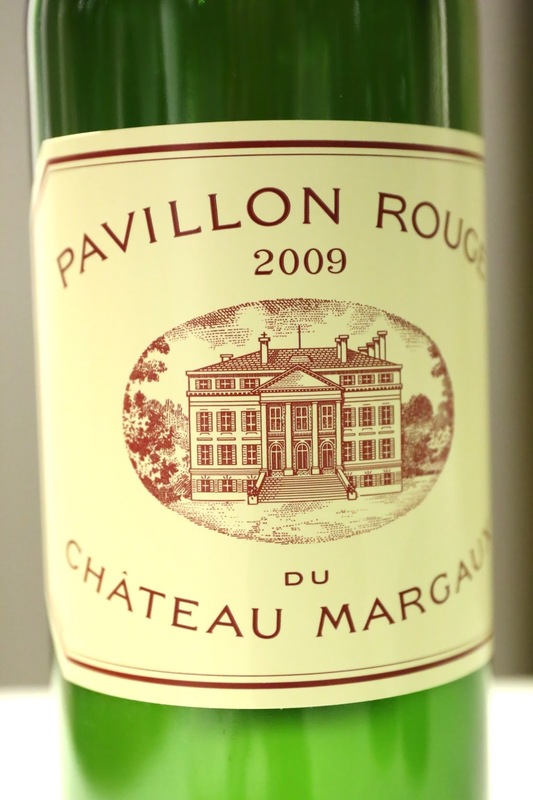 2009 Pavillon Rouge de Château Margaux - double-decanted for more than 3 hours prior to serving. Nose of forest, pine needle, a little smoke and pencil lead. Slightly more sweet fruit on the nose. Surprisingly this was not to tannic for a wine so young. Pretty enjoyable now, but what amazing potential in the years to come! 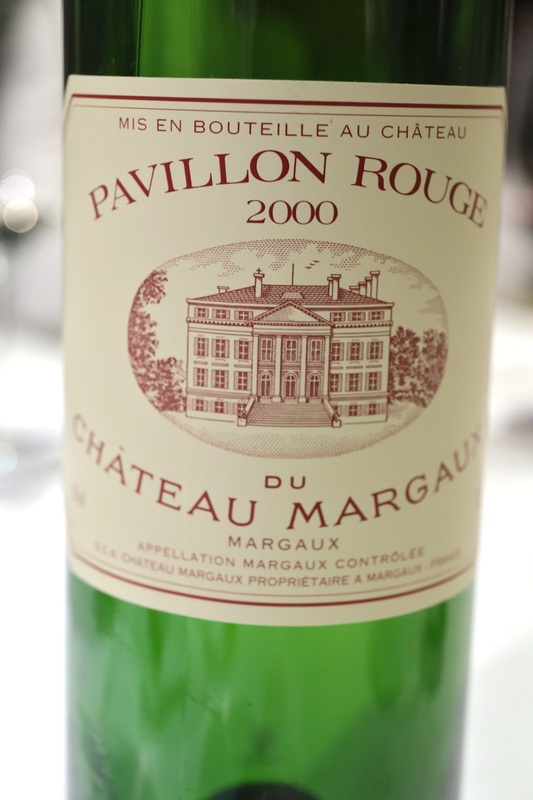 2000 Pavillon Rouge de Château Margaux - double-decanted for more than 2 hours prior to serving. Love the big and smoky nose. More fragrant, floral, and elegant, with cedar and slight earthy notes, along with exotic spices. Naturally this was softer than the 2009 and drinking incredibly well. Roasted pigeon, oats, Sauternes grapes, trompette mushroom - very nicely done, with sweet grapes and a light mash again balancing out the heavier flavors of the jus. The trompettes de la mort were nice but I wish there were more of them. The pigeon was not as pink as I would have liked, but still nicely done so that it was very tender and succulent. 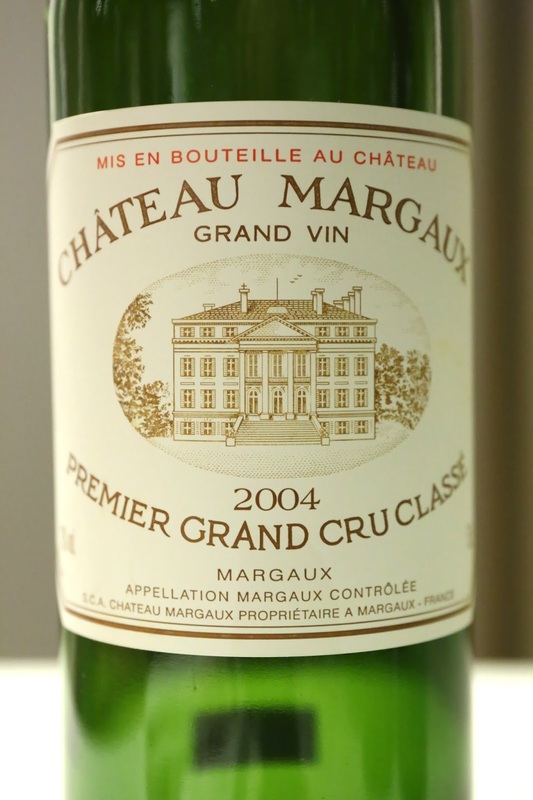 2004 Margaux - there's a certain amount of ripeness and sweet fruit here, with some spices. Fresh, young, and vibrant. 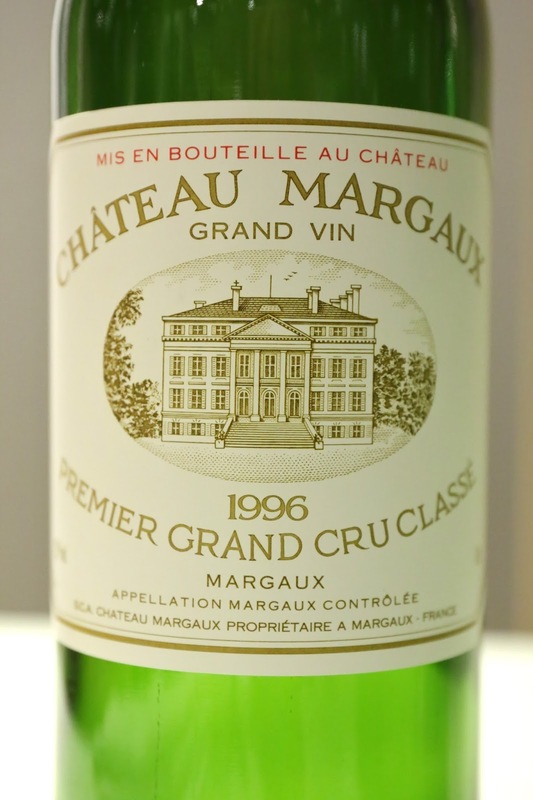 1996 Margaux - first whiff of the nose was more medicinal, but this quickly gave way to a big and smoky nose that was open and lovely, with cedar and pencil lead notes. Slightly alcoholic on the nose. Soooo nice, and definitely wine of the evening for me. Braised wagyu beef cheek, French winter truffle jus - this chunk of beef cheek was certainly bigger than I had expected, and the flavors were pretty big and heavy. Oh-so-tender and the knife almost cut through it like butter... While initially I would have preferred a bigger wine to go with it, on reflection the higher acidity level of the '83 actually worked better to cut through the richness here. 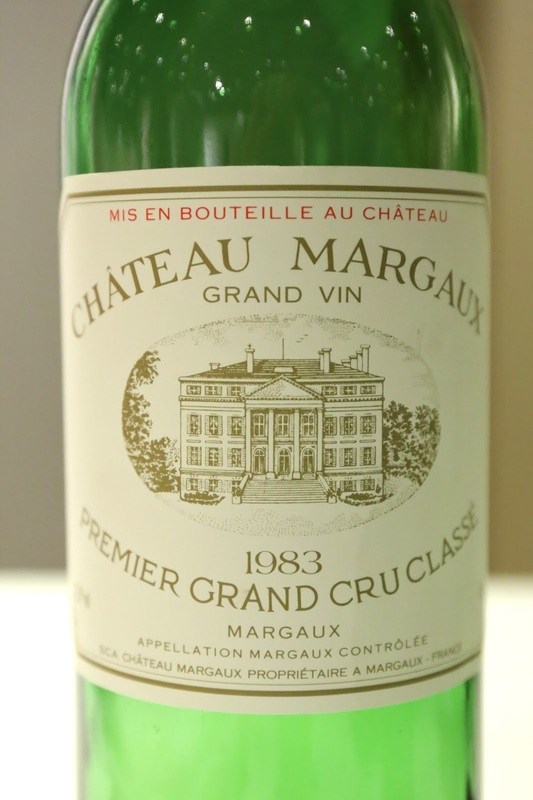 1983 Margaux - nose was very grassy and sweet, and the smokiness came out a little later. Nice and fragrant nose. Silky smooth on the palate, naturally. Classic apple tart and vanilla ice cream - at first glance I thought they had listed the wrong dessert on the menu, as this looked more like a tarte au citron. But it was indeed an apple tart. Not bad. Mignardises - the hazelnut macarons were decent, and the coffee chocolates were delicious.